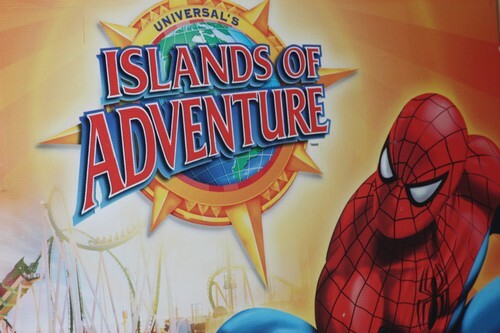 Home » Lifestyle » Islands of Adventure or Universal Studios ? Islands of Adventure or Universal Studios ? I think I am turning into a travel blogger…Universal Studios, Medieval Times, The Biltmore, Disney, and an upcoming cruise in November. But it all started with Universal Studios. A few weeks back my dad and I went down to the Tampa area for the opening of the football season and took an extra day to make a pit stop in Orlando to visit the parks. Universal Studios was kind enough to accommodate us with 2 media passes so we could parooze what they had to offer- I haven’t been in many, many years. The day started out quite dreary to be honest. We woke up to an overcast sprinkly gray morning, but with no kids in tow, it was a lot easier to face. One thing I really love about Universal is when you arrive to the park via the Citywalk, its a pretty walk to the parks themselves. The layout is unlike any other theme park in Orlando where after you drop off your car, you walk through a shop and restaurant filled location that carries you in the right direction. Let me mention that Citywalk also has Hard Rock Cafe and Margaritaville, both which of are worth hitting up if you are in town more than a few days. 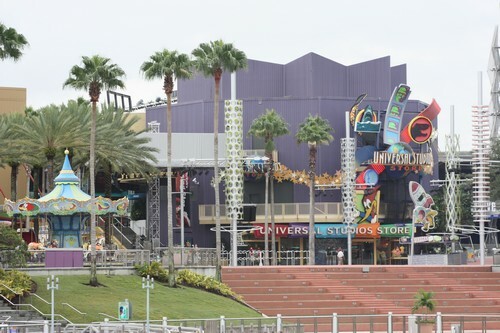 Universal Studios vs Island of Adventure? Universal hosts several parks in the area and one of the great things about purchasing a ticket is that you can get dual park entry . And since they are literally 100 feet from each other, you can walk out one entrance and right into the other park. No leaving the area, driving to a new location, and going through an hours worth of entry to eat up your day. If you have favorite rides in each park, and surely you will, you can go back and forth with ease. We started out at Islands of Adventure. I have been about 15 times to this park. As a college student, it was only an hour from me so we did our time there on the roller coasters. Due to the rain, the park was nearly empty so it was 5 minute walks up to each ride. Hands down the best ride in the park is Spider Man. It combines movement, virtual reality, and a death defying experience that will get you laughing with either terror or fun. Even though the rest of the park is of course a great time, Spiderman will stay in your head a long time, so don’t be surprised if you feel let down by further rides after that. Somewhere around 28 years old my equilibrium changed and roller coasters were no longer the fun thrill seeking adventure they were in my younger years. Against my better judgment, Alicia conned me into getting on Dueling Dragons, where afterward I spent the better part of an hour trying to keep my food down. Its a great coaster, one that has dual hanging seats that intertwine while they simultaneously “chase each other”. In short, it will scare the doo-doo out of you. ROLLER COASTER TIP: For the best ride skip the front row and ride the last row. It has a higher G-force. I completely understand keeping some rides for children only, but would love to see an adult version of that that went over the park. Coming soon to Islands of Adventure is an entire Harry Potter and Hogwarts location. I am sure its going to be a HUGE hit. Currently Universal Studios offers a meal plan where you can eat at specific locations in the park. After talking to some employees, who actually recommended we DONT use the meal plan, we skipped it and ended up taking our lunch outside the park at one of the sit down locations in CityWalk. Hey, atleast they were honest, right? After lunch we walked over to the main Universal Studios park. From ride 1 to the last ride, that park was one of the best times I have had in a long time. I attributed Universal Studios to an old outdated park that still hosted Jaws and King Kong. What I found was a coaster I refused to watch, much less get on, interactive rides, games, and interesting shops around every corner. I was actually wishing we had just spent the entire day at Universal. 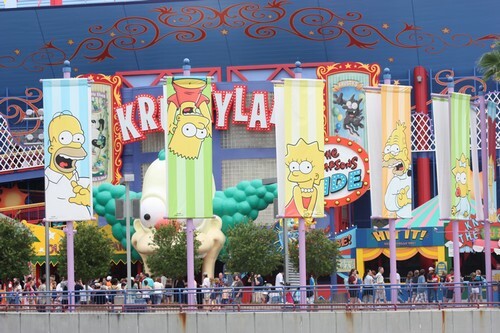 While you are there, do NOT skip the monster show (kinda PG-13) or the Simpsons Ride. We barely squeezed The Simpsons in the last 2 minutes of the park. They had a special event going on for a concert and if we didn’t have bracelets after 6, we couldn’t get on any rides. The park employees were actually super nice and still let us in line at 5:59. Having been to a Disney event recently where a special event was going on, I can say that they push you out and direct you out of the park almost immediately when the event starts. Universal let us walk around and go into shops and eat on the way out without escorting us to the front gate. It was a lot more low key in how they handled it. 1500 calories in rice krispie treats, candied apples, and cheesecake and one wall climbing and psychic reading later, we made it out of the park exhausted and wondering when we could come back next. Overall Impression: Massive updates, great ticket price, and perfect location make Universal Studios the park for older kids and adults alike. I recommend the Main park over IOA personally, but of course it depends on the ages of your children and what kind of experiance you are looking for. TAKE A PICTURE OF your car location. Experience a one-of-a-kind holiday celebration at Universal Orlando®®, featuring a live version of “How The Grinch Stole Christmas.” At Universal Studios®, the Macy’s Holiday Parade™ takes to the streets with new balloons and floats, marching bands, colorful performers and more! Hollywood Studios Presents Star Wars Tours! Check out the dates for 2013 Star Wars weekends here! Where did you apply for your Islands of Adventure media passes? Where did you apply for the media passes for Islands of Adventure? I haven’t been on a roller coaster in forever… This makes me want to plan a trip and travel soon! OH MY GOSH!! what a freeking awesome time that looks like. I so want to go. is it bad that I want to go without my kids? I’ve never been but it sure does sound like fun! Sounds like a wonderful day! Though I’d definitely skip most of the coasters, I’d love to visit some day! Oh man, you’re making me want to go back right now!!! We haven’t been to IOA/Universal in about 8 years but I remember the Hulk roller coaster like it was yesterday. That was awesome!!!! 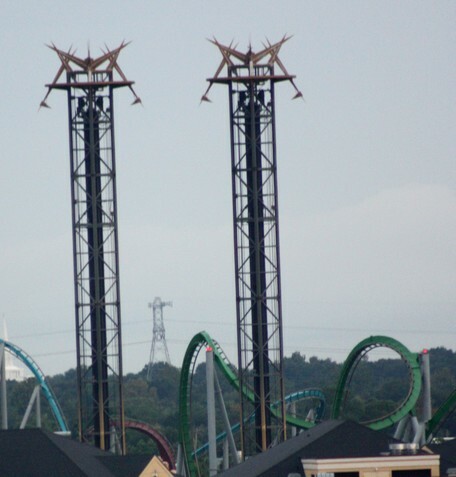 And the Dueling Dragons! I have never been, it sounds like a lot of fun though. I love roller coasters! We have been debating on whether to go to Universal for awhile now and with all the Harry Potter tings coming up I know we will have to make it a stop. Thanks for all the info. IT looks like you guys had a blast! When we went to Universal on our honeymoon, we got to go to the sneak peek of Islands of Adventure. It made such a good impression on us, we went back in 2007. Spider-Man was The Best. We also did something neat, looking for some “easter egg” type things, similar to hidden Mickeys, but better. And funny thing, when we went during our honeymoon, we lost our rental car! I know it took us at least half an hour to find it. We went in 2007 and I can’t wait to go again!!! We had a freakin’ blast!!! 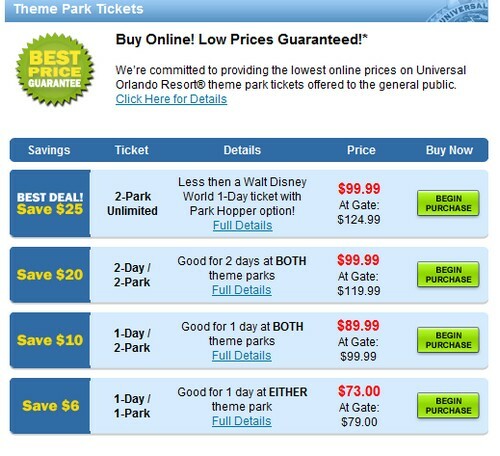 I think at Universal Stuidos (In Cali maybe) are offering if you buy a one day pass you get a full year pass too! I think!!! I do have coupon for that though too! I realized 2 yrs ago at the state fair that there are some rides I just shouldn’t get on anymore. I was sick for 2 days. I hope to one day get a chance to bring my kids to Universal Studios. Hopefully before they are all grown up and out of my house. I’ve never been there but it looks interesting to say the least. At some point between 16 and 26 I realized I’m no longer invincible and roller coaster just scare the crap outta me now…coming from the girl that use to bungee jump and hit up the scariest coasters 2-3 times in a row. Gotta love getting old.